Congressman Pat Meehan (R-Delaware) said Tuesday he did have an “affection” for the former staffer who is accusing him of sexual harassment. Meehan told the Inquirer that told her last year he viewed her as a “soul mate,” but never pushed for a romantic relationship with her or harassed her. In the interview with the Inquirer, Meehan confirmed the outline of the New York Times story that said he expressed romantic desires for a female staffer. Meehan confirmed the outline of the Times story, which said the married 62-year-old expressed his romantic desires to his aide after she began a serious relationship with someone else, then grew hostile when she did not reciprocate. After filing her complaint, she received a settlement and ultimately left the job, and reportedly felt traumatized by the entire experience. But he denied harassing her, and said any hostility he may have exhibited stemmed from stress around high-pressure votes last year over the Affordable Care Act. He said that he sought to remain loyal to his wife, and that he used his office funds to settle the harassment claim so he and the aide could move on and keep the issue private. Meehan said that the woman worked with him for years and was an important part of his office, which lead to a close working relationship and stronger feelings. “As you bask in this moment of extreme joy I want to share with you my sentiment of how richly it is deserved. You are kind and sensitive and caring and infectious with your laugh. You are and have been a complete partner to me and you have brought me much happiness,” the letter reads. The Democratic Congressional Campaign Committee (DCCC) jumped on the report as a chance to push against Meehan. 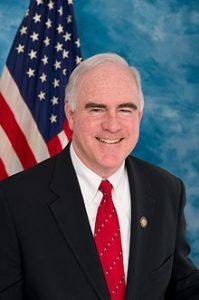 “There’s no longer any doubt: Congressman Meehan admits to creating a hostile work environment and harassing a young woman in his office, but he refuses to take responsibility for his own reprehensible behavior. This woman deserves credit for standing up to a powerful man, and it is deeply unfortunate that Congressman Meehan used his power to effectively end her career,” DCCC Communications Director Meredith Kelly said in a statement. This whole episode just gets more and more creepy, and he isn’t doing himself any favors. It seems likely his on-the-record discussions violate the NDA unless it was ridiculously one-sided, so his victim may even have a cause of action. It’s time for Meehan to pay back the taxpayers and then do the honorable thing and resign. Meehan blames the “high-pressure” Affordable Care Act votes for his behavior. 1) He had no problem voting for repeal dozens of times when Obama was President and a guaranteed veto meant his vote was meaningless/hollow. 3) Viagra is covered, and was probably too “affordable” for Meehan to resist. it’s NOT: “you are my soulmate”. Your clock runs backwards, and is in the last century. This country can’t be right until the corruption is cleaned up in Congress. So much family values double talk. It is sick too what Nunes is doing to undermine all the checks and balances against the executive branch. When Meehan resigns, who can win it from the GOP side? What the hell does Mrs. Meehan say about this? Did she lose her soul mate role? How about His kids? They must think their old man is off his rocker! I wonder if Sen. Regan considers the staffer the cleaning crew saw him with his “soul mate”? The true love story in the Capitol is Rick Saccone and Yoko. House security found them under the Speaker’s rostrum. I can’t wait until loser Regan goes! Winter-Spring romances always end in seasonal crazy disorder. The price of viagra got passed on to the chump taxpayers. So, Pattie Boy. How much does a Soul Mate cost? Same as in town? 1) Why should we pay for this settlement simply because we live in his district? He needs to return the money and leaders need to introduce legislation requiring the offender to be personally responsible, not the taxpayers! 2) I bet she doesn’t share his feelings on the whole “sole mate” issue. 3) interesting how the “family values” voters are silent on this issue as well as the President’s indiscretions. Exactly. He denies it, but she was paid a settlement. His own statements are VERY creepy. This dude is a weirdo. His creepy statements make me wonder if more will come out? Nothing came out and that’s why he’s so flustered.